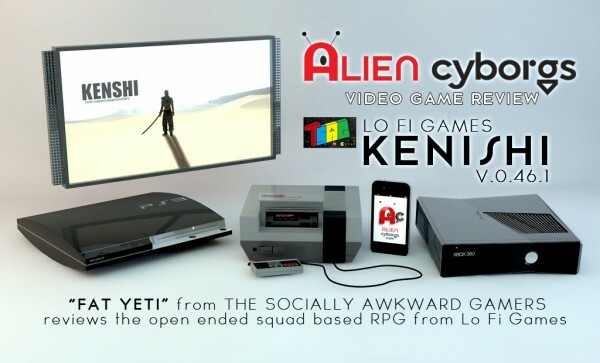 “Fat Yeti” from The Socially Awkward Gamers gives us an indepth review of Lo Fi Game’s “Kenshi” V.0.46.1 Even though the game is in still in beta it offers enough to keep you invested. 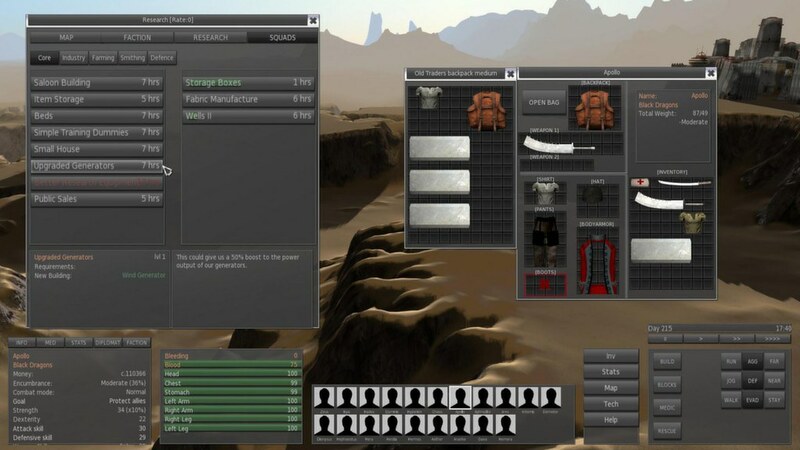 I came across Kenshi whilst browsing the section on Steam, which allows people to buy a game which is still under development, but usually for a reduced price. As its still in development, it does have bugs, and things missing, but its developer, Lo-Fi Games, are continually releasing updates to improve and further develop the game. 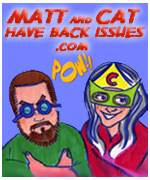 This is why in the title I included the update version of the game which I was playing when writing this review. 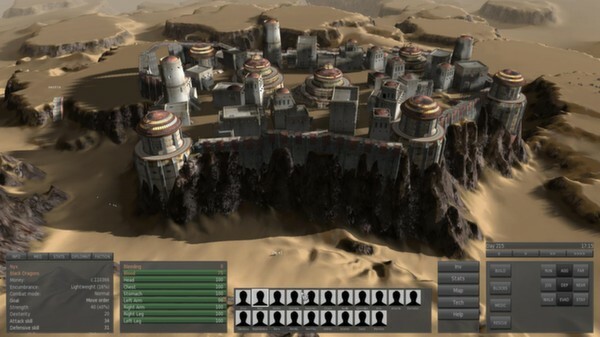 Game Play: The game is based in a desert setting with a Japanese style, where you have samurai and bandits with katanas. 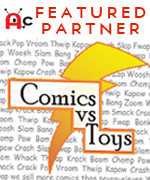 It has been described as an open-ended RPG sandbox, which is just a bunch of words meaning that essentially you play as your character, and do what you want, without an end game objective. When starting the game you can choose from 6 different scenarios, each with a small backstory, and different assets. I usually choose “The Freedom Seekers” option, as you immediately start with building supplies, a small team, and some money. A bonus, but not a huge one, it just gives you a little head start into the game. You then go on to customize your character, and then spawn in any one of the many cities on the map (which is a very impressive 400 km). *That’s a whooping 248+ miles this side of the Atlantic. Immediately from here it’s up to you to decide what to do, you’re given no further instruction and have to explore your own path. As the description above says, it’s an “open-ended sandbox”. However, if you do run into trouble, there are many player written guides available which can help a great deal and further introduce you to the game so you’re better prepared to set out into the world. STRATEGY: What I did, and what I believe many other people also did, was march my men straight out the front gates of the city I spawned in, built a little house, and was then immediately attacked by bandits and died. Stupid, I know, but I hadn’t a clue what I was doing, but when I gathered resources, found a defendable flat area, built a house and research bench, and then some defences, the exact same thing happened to me, and again, and again, until I realised 2 hours had passed in the blink of an eye. I didn’t find it frustrating as such, I just enjoyed the challenge which isn’t present in many games these days. In the end I resorted to building a farm near a city, so that when bandits did attack I’d just run to the city and let the guards take care of them for me, they even showed the courtesy of not looting the bodies so I could scavenge what I wished from the corpses. No matter what game style you go for, at some point you’ll likely need to build yourself a base of operations and with it a research bench. The research bench is used for researching new technologies in many different fields, such as farming, mining, and industry; giving you the potential to develop an empire. 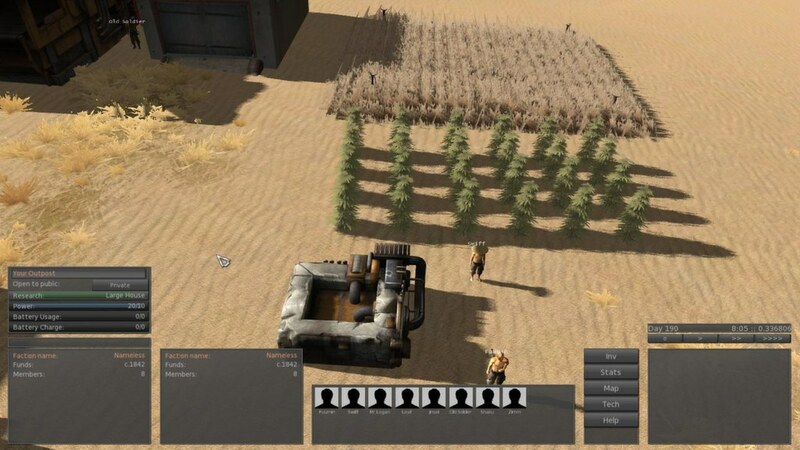 STORYLINE: There isn’t much I can say about the story, as there isn’t one as such, but the game allows you to create your own story, become a mercenary that raids caravans going to nearby cities, build up a mining organisation, or become a farmer trying to survive in the desert. I’m also sure that as the game develops, more and more opportunities will become available. UNIQUE FEATURES: The game is that whilst you create your own character at the beginning, it isn’t different in any way to any of the other characters. You play the part of a completely normal character, which is no more powerful or special than any other character in the game. The aim of this is to allow you to connect to other members of your team, and manage them more effectively rather than pooling resources into your own character. You can even continue playing if your character dies as long as you have other members in your team. GAMEPLAY: Another point worth mentioning is that the damage you take affects your gameplay, for example, if the character take damage to the legs, he walks slower, or even crawls, your character can even suffer from blood loss, pass out, and die. An interesting point about the game is that there is no level scaling, meaning that as soon as you start you can face incredibly hard opponents, shop owners won’t change their inventories as you level up, making it potentially harder for you to find equipment better suited for your level, and if you try attacking a caravan, their guards may wipe the floor with you. It’s important to remember that the game is in early development, but future updates promise to bring ecosystems, creatures, AI factions which you can wage war with, and much more. 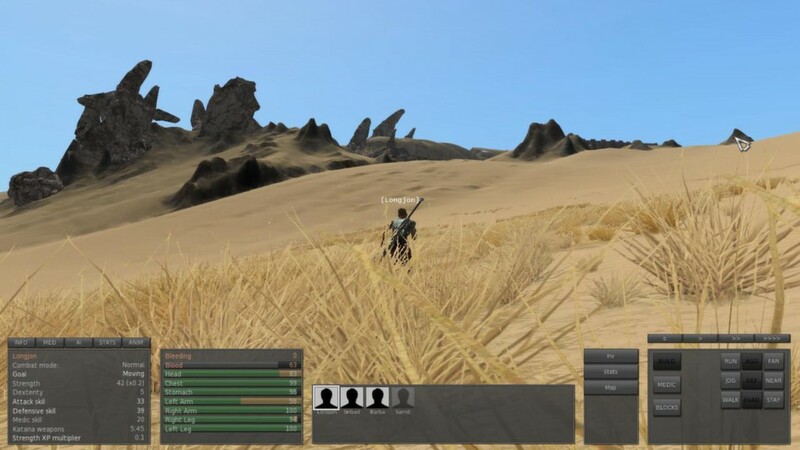 6aming did an interview with the creator of the game Chris Hunt, and discussed the possibilities of Kenshi, it’s well worth checking out, and offers an insight into the future of the game, and the man behind it.